This shocked the older generation, many not following the trend. Younger women embraced the style and found it a refreshing change. Hair was shingled (hair tapered into a v shape on the neck, and worn in waves or curls) Bobbed, then cut into the Eton Crop. Women were shunned by their husbands, told they'd get 'shingle headaches' and mothers declared they didn't know the difference between their boys and girls anymore. Hair was often adorned with feathers, turbans, glittering headbands and barrettes for the evening. These ladies made it the height of fashion to have short hair. Long hair no longer defined a woman. I really think this is when we started incorporating fashion into our hair, and we started really thinking about fashion as a whole. 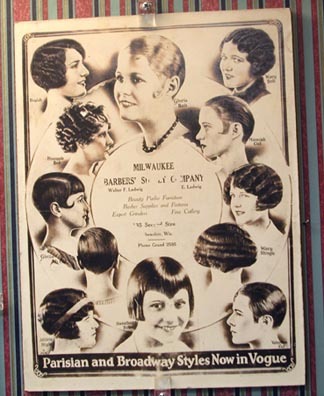 Amazing to think women rushed to copy this style, but were turned away from hairdressers and ended up in their local barbers to get the snip. We had Gwen rocking the lock in No Doubt,and Nicole Ritchie is a huge fan of the jewelled headbands worn low on the forehead. Charlize Theron also looked amazing with her 20's inspired bob. I also think Christina Applegate looks fantastic with her bob. 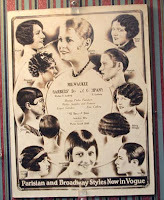 The 20's are a huge inspiration on today's hair styling. As with fashion, many ideas and trends rotate and are incoporated into today's styles. What do you guys think? Could you see yourself as a 20's flapper? Long beads, rolled stocking and scallop dress? What a fabulous post, Kel,love the facts. 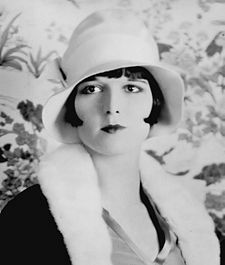 As Flapper fashion was the first fashion trend to be adopted by the masses it's not surprising that the ladies of the day copied the hairstyles, too. 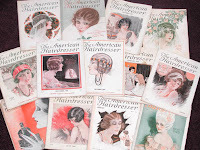 I was quite amazed how my flapper-style post looked and quite liked the look of me with a bob. I'd like to challenge you to blogging ten days of Twentieth Century hair. Aw I like posts like this! Great facts! God I am in love with the iconic look of the 1920's! Love the Flapper girl bobbed hairstyle and the embellished hairband! Milly & Pippa, I challenge you to don a glittery headband! Sure you'd both look fab. BBB - Vix will make you jealous then, she sported one on her blog recently! Vix, I'm taking up your challenge. Ten days of Twentieth Century Hair coming up. Hope you enjoy.